Το μέγεθος αυτής της PNG προεπισκόπησης αυτού του SVG το αρχείο: 800 × 406 εικονοστοιχεία. Άλλες αναλύσεις: 320 × 162 εικονοστοιχεία | 640 × 324 εικονοστοιχεία | 1.024 × 519 εικονοστοιχεία | 1.280 × 649 εικονοστοιχεία | 856 × 434 εικονοστοιχεία. This image requires updating because: outdated information – most recent figure for Australia prevalence (2012) is 26% for adult males ages 20-29, per http://www.circinfo.org/statistics.html. Slovenia (2001) was only 4.5% . In doing so, you could add a timestamp to the image. 13. Demographic and health surveys. MEASURE DHS, 2006 (http://www.measuredhs.com, accessed 21 September 2006). 53. Drain PK et al. Male circumcision, religion and infectious diseases: an ecologic analysis of 118 developing countries. BMC Infect Dis, 2006, 6(1):172. 54. Williams BG et al. The potential impact of male circumcision on HIV in sub-Saharan Africa. PLoS Med, 2006, 3(7):262. 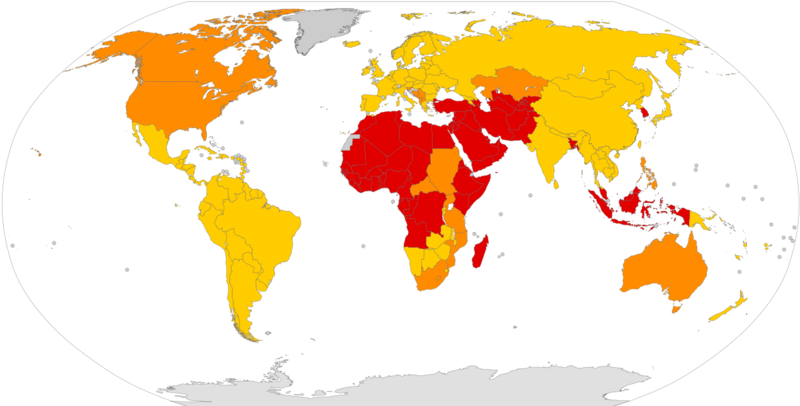 55. International religious freedom report for 2004. U.S. Department of State (http://www.state.gov/g/drl/rls/irf/2004/index.htm, accessed 21 September 2006).